Air Poll Jet Venturi is a device specially designed to scrub huge volumes of gases with the help of "Vena Contracta". There is sudden expansion and contraction near the venture throat where the velocity of the gas is very high and separation takes place which is known as Vena Contracta. 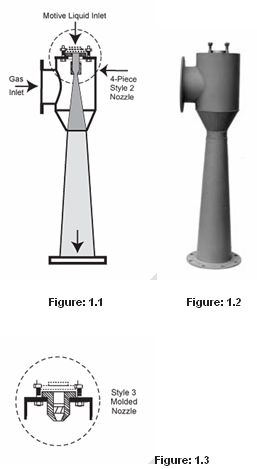 The Motive fluid, generally water leaves nozzle in a hollow cone spray, creating a draft which draws the gases and vapors in to the moving stream where it is continuously scrubbed. Jet Venturi scrubber is highly efficient for the fume/ gas scrubbing. Fig. 1.1 Jet Venturi Fume Scrubbers are very effective at removing noxious gases, particulates, odors, fumes and dusts from gas streams. Particulate contaminants are removed through impaction by the high velocity spray of scrubbing liquid. Gases and odors are eliminated through absorption and/or chemical reaction between the gases and scrubbing liquid. When properly matched to the application, these scrubbers, by their nature, are better able to cope with the high temperatures, heavy contaminant loads, and corrosive conditions often encountered. Fig. 1.2 Jet Venturi Fume Scrubbers offer the following competitive advantages: low initial cost, low energy requirements, simple design with no moving parts which means low maintenance, continuous operation (as opposed to bag houses and precipitators), no electrical requirements, simultaneous gas absorption and particulate scrubbing. Fig. 1.2 Jet Venturi Fume Scrubbers most often operate with a pressure rise or draft. This serves a dual purpose: to boost the pressure of the gas and to clean the gas at the same time.